Mary Theresa Streck of Menands in Albany Co. is warmly supported by Capital District Call To Action in her journey towards Priesthood. As part of the Roman Catholic Women Priest tradition she will be ordained a Deacon next month. Mary Theresa has a long career in education and currently holds a Doctorate in Education Leadership from Sage Colleges. Over the years Mary Theresa has devoted herself to social justice issues and has engaged in civil disobedience against policies of the U.S. Government which have resulted in short jail stays in local jails. Formerly a Sr. of St. Joseph, Mary Theresa married former Priest Jay Murnane in 1984. Together they started the Ark, Inc., a small after school arts program which expanded over the years to an education and enrichment program for many underprivileged youngsters in the City of Troy. Later, the couple was part of a group which opened the first Charter School in Troy. Saturday ~ June 22, 2013 ~ 1:00 p.m.
Capital District Call To Action will offer a Witness for Women at the time of the Ordination to the Priesthood at the Cathedral of the Immaculate Conception on Saturday June 8, 2013 from 10:00am to 11:00am. The Witness will end when the ordination ceremony begins. We will gather outside the Cathedral across the street from the front entrance. Please bring homemade signs which indicate your support for gender equality in the Roman Catholic Church and support for the ordination of women. Questions,call Steve P. at (518) 370-1615. Recorded May 4th at Church vs. Conscience Event at Judson Memorial Church, New York City. Please note that Future Church is hosting a teleconference call with Dr. Phyllis Zagano on Women Deacons on May 22. More details to come, but you can go to www.futurechurch.org now to register. CTA member MaryLee Raymond Diamond. Roy Bourgeois, a former Maryknoll, told his personal story, including call to priesthood and call to social action; it can be found online www.roybourgeoisjourney.org . He spoke about growing up in the South in the segregated schools and churches when “separate and equal” was the main phrase used to justify the segregation and how “tradition” was also used as an excuse to continue it. He said there is a parallel with the injustice done to women in the church, and that just as segregation was overturned, he feels there will be a day when the Catholic Church will acknowledge the injustice done to women in the church and change. * He started calling for the ordination of women in the church in 2008. His failure to recant has resulted in church sanctions — he was dismissed from Maryknoll and expelled from the priesthood. * Roy defined solidarity as” making the struggle of others your struggle”, saying he learned the meaning of that while working in Latin America and that impelled him to start the campaign to close School of the Americas, where many of the human rights violators of Latin America had been trained. It also motivated him to identify with the injustice towards women in the church. * Injustice in the church = women cannot be priests, yet few of the clergy or hierarchy are identifying it as a problem. They claim “it is our tradition” or “women are equal but have separate roles” to justify the situation. This defies both faith and reason and cannot stand up to scrutiny. * What should we do when we see injustice? Silence = voice of complicity; do not be silent. Social justice movements are unstoppable; if they are rooted in justice, dignity and equality, there will be change. * When asked how the laity can support priests who defy the hierarchy, Roy responded: acknowledge the person who speaks out, so that s/he knows they are not alone. * When asked if the push for women deacons is a compromise for the push for women’s ordination, Roy responded that there is no theological impediment to ordaining women deacons, but the church does not act. Remember that Jesus did not ordain anyone. Call out the church officials when they try to justify it with “Jesus only chose male apostles”. * When asked if women who have a call to priesthood should step outside the church to answer that call, he said: We must reform our church and break our silence. Change does not come without risk. Women who feel the call are made to feel unworthy. That’s not nice of our Holy Mother Church. Leaving the church to pursue the call to priesthood (i.e. going to another denomination), lets the bullies win. * When asked if all the talk about women’s ordination makes it harder to get women deacons ordained, he said: What is underneath the fear? Women are already leading faith communities. Push back in the face of the arrogance of power. * When asked if the Pope missed an opportunity about the LCWR, he responded: Yes. Don’t let anyone hijack the message of Jesus. Remind the male clergy that Jesus would not approve. * Future Church’s position on women’s ordination: respect the leading of the spirit and the call of conscience. To ask one to recant from a statement of conscience is a shameful sin and a terrible price to ask us to pay. There should be a moratorium on sanctions & excommunication. Church clergy should enter into a dialogue with women who have the call and their supporters. We should study and pray on the issue of women’s ordination. Future Church’s MILLION VOICES PROJECT calls for opening the discussion of women’s ordination to the priesthood and the diaconate. We have emphasized the deaconate because we feel that has a possibility at this time. * The 2009 changes in canon law may open the way to ordaining women as deacons. What should be do? Identify candidates. Learn more about the rich history of women deacons in our church. In the 13th century, ordination was redefined. All evidence of women deacons was then reinterpreted in light of the new criteria that was established. We need to understand what lens is brought to the reading and studying the scriptures. * Women created waves in the early church. Male clergy worked to restrict women’s roles in the church until women deacons were defined out of existence. 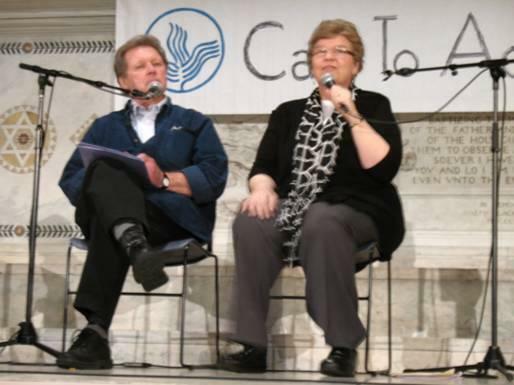 To learn more about women deacons, sign up for Future Chuch’s May 22 webinar “Finding Your Voice” featuring Dr. Phyllis Zagano, who is a leading expert on the topic and long-time advocate for women deacons. * Catholics have a sacred duty to educate/inform their conscience and follow it. We can responsibly dissent when our conscience is in conflict with the teaching of the church (see Sister Beth Johnson’s article in Commonweal on responsible dissent).